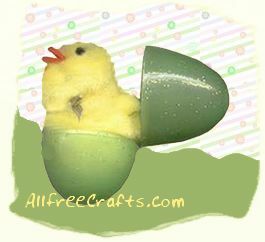 These little chicks look so cute and fluffy hatching from their Easter eggs that you might just want to make a whole family of them. Glue the face and body together. For the wings, trim away most of the fluff into a triangle shape. Glue the wings with the pointed end of the triangle shape pointing out of the body. Cut two triangle pieces from orange craft foam or felt and glue in place for the little chick’s mouth. Glue little black buttons, beads or wiggly eyes in place. Push the buttons into the fluff … you don’t want the eyes to be too dominating. Tie a little bow around the chick’s neck. Place inside a plastic egg shell and you are all done!